FC United of Manchester had their first game of the season yesterday. My husband takes Joseph every home game, and requests a hale and hearty tea for when they come home. He requested cheese and onion pie. The thing about food is that there is a time for all foods. Most of the time I eat a very healthy diet now, but that shouldn't preclude the odd meal that is a little outside what I would normally eat. I played around with my usual cheese and onion pie recipe to lighten it up and I was very pleased with the result. Firstly, the pastry. I stuck to my regular ready rolled puff pastry. 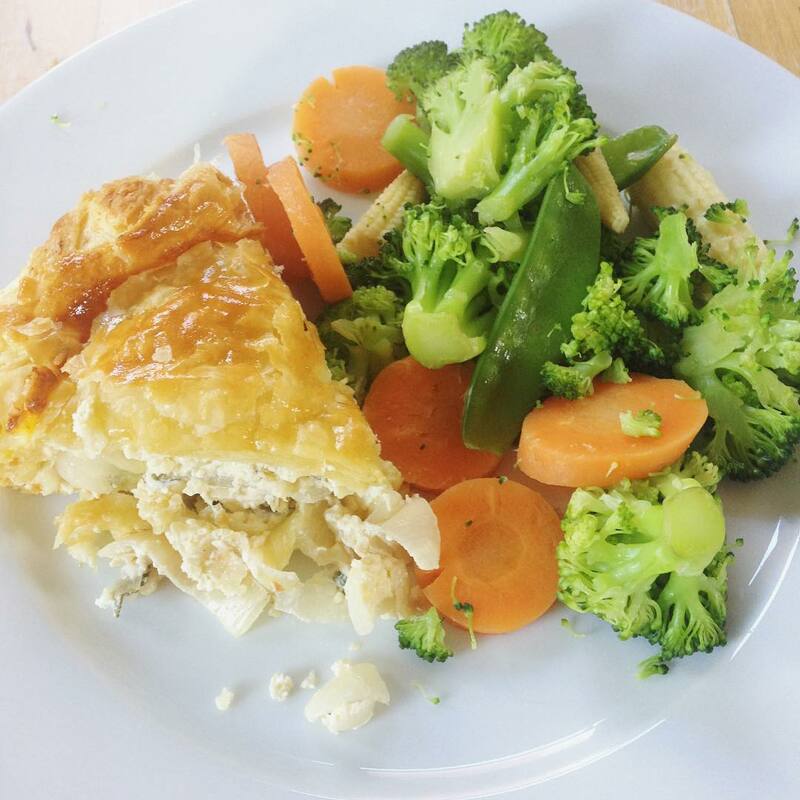 As an Aussie pies are usually puff/flaky pastry so I decided not to pursue a low fat pastry recipe and go with what I like. The filling was delicious, you can substitute normal onions but try this as it is really lovely. Set your oven to 180 degrees celsius and grease your pie dish. I use a cake tin. Line it with pastry, you may need to re roll your scraps to make the lid. Melt the butter in a small frying pan then add your three types of onions, you do not want them to brown, just simmer gently until soft over a medium heat. Allow to cool in a bowl then add quark, the cheeses and the egg yolks and stir until combined. I also added black pepper and fresh sage here. Pour into the pie dish and add your lid, having first moistened the edges with water. Glaze with a beaten egg and bake for approximately 30 minutes. I allow mine to come to room temperature or near enough before serving, if serving hot allow to sit at least ten minutes. I served the husband's with chips and baked beans, I had steamed vegetables. 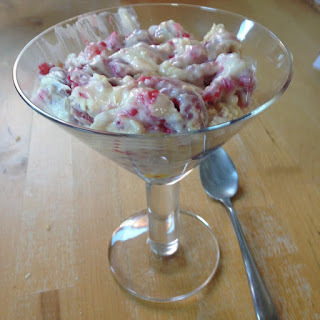 Eton Mess hardly needs a recipe so I shall just tell you how I did it. I used the two egg whites I had left over from the pie to make meringues with 100 grams of caster sugar. Once cool I broke them into pieces. I melted 100 grams of white chocolate in a bowl over boiling water then mixed in 250 grams of quark and beat until smooth. I then added the meringues and 2 punnets of organic raspberries and placed in the fridge to cool. It was lovely, the quark stopped it from being too sweet and the chocolate combined beautifully to give it a cream like consistency. I've found Slimpod has really changed my relationship with food. I enjoy preparing food more than ever, and am able to have the odd treat meal in a healthy way without it becoming an issue or derailing me. I was straight back out exercising this morning and have eaten my new normal all day. I really cannot recommend Slimpod enough and I'll give you all an update later in the week as to how I am doing. Follow our trades right now and earn up to 270% daily. New Diet Taps into Revolutionary Plan to Help Dieters Lose 12-23 Pounds within Just 21 Days!